Now, the thought of having leftover Halloween candy may seem laughable to you (a lot like having leftover wine or baked goods). However, some years I over-estimate the number of trick-or-treaters we will get, and even my sweet tooth is no match for what we have left. Don't worry, Pinterest to the rescue. I found a few recipes on my Halloween board that would be perfect for using up some of that leftover candy: Halloween Candy Bark from Brown Eyed Baker, Candy Bar Cookie Bars from Joy the Baker, and Peanut Butter Nutella Candy Bar Brownie from How Sweet it is. 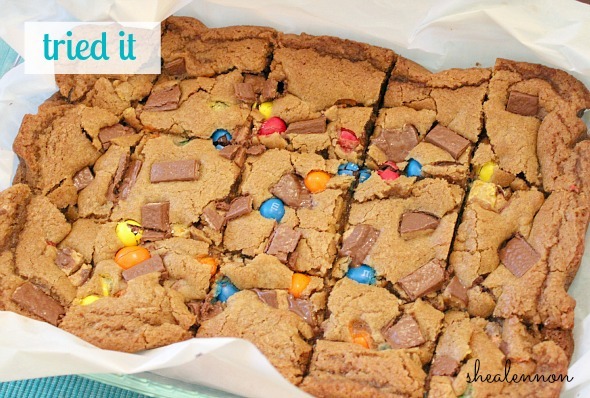 All looked like delicious ways to use up some candy, but I decided to try the cookie bars. I needed a treat to bring to a friend's house, and these bars were the perfect dessert to bring. 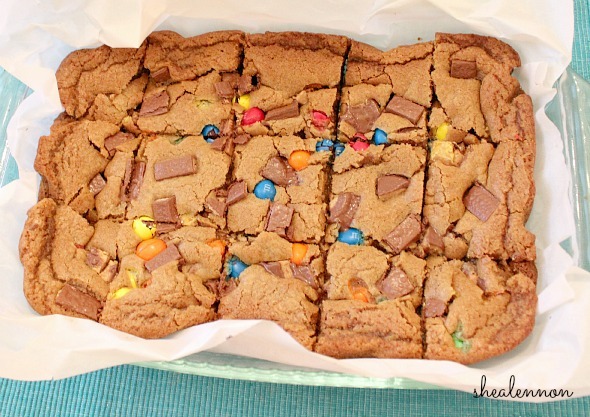 The chewy, rich cookie dough is mixed with a mix of different candies and candy bars and baked. I used Reese's Peanut Butter Cups, Kit Kats, and Peanut M&Ms, but feel free to use whatever you have. This was easy to make and got rave reviews. 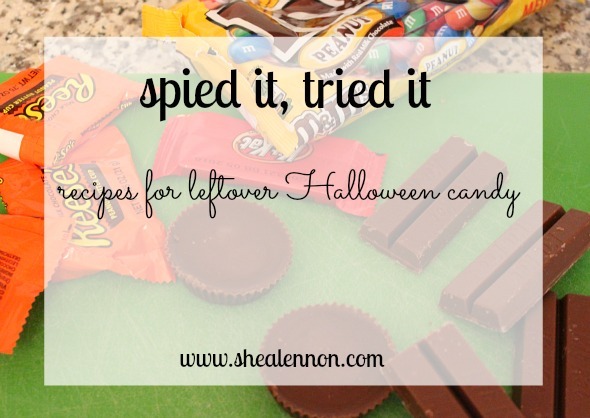 Do you have any favorite recipes for using up leftover candy? Speaking of Halloween, I wanted to share Jona in his Halloween costume. 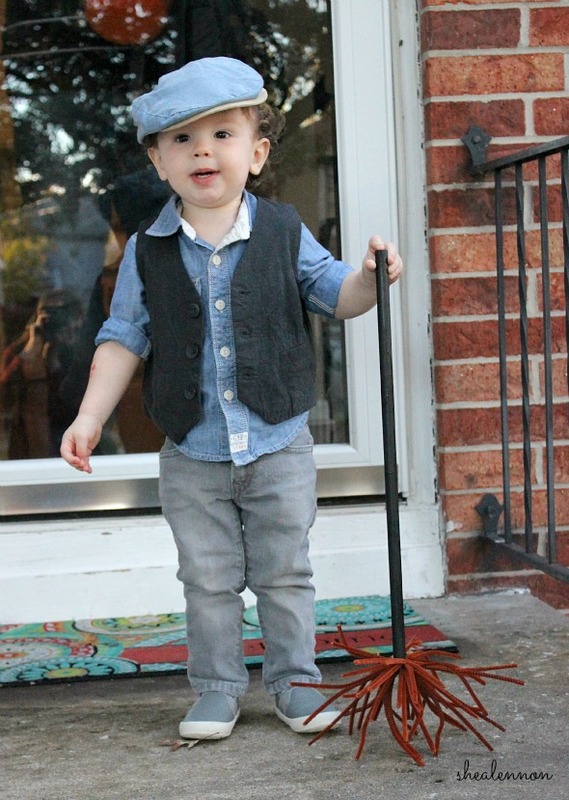 He went as Bert, the chimney sweep from Mary Poppins, or "Chimmy Chim" as he calls him. 5 years ago: wearing shades of gray and black. 3 years ago: wearing classic pieces with bold accents. 1 year ago: wearing lots of blue.